Preliminary design plan for a large scout cruiser, called a "Battle Scout", prepared in response to an oral request from the General Board on 12 June 1915. These Battle Scout designs apparently were intended to explore what capabilities might be provided in a large ship type having fewer heavy guns than a Battle Cruiser but having a significantly heavier main battery than the typically lightly armed Scout Cruisers studied earlier in the year 1915. No such Battle Scouts ever were built. 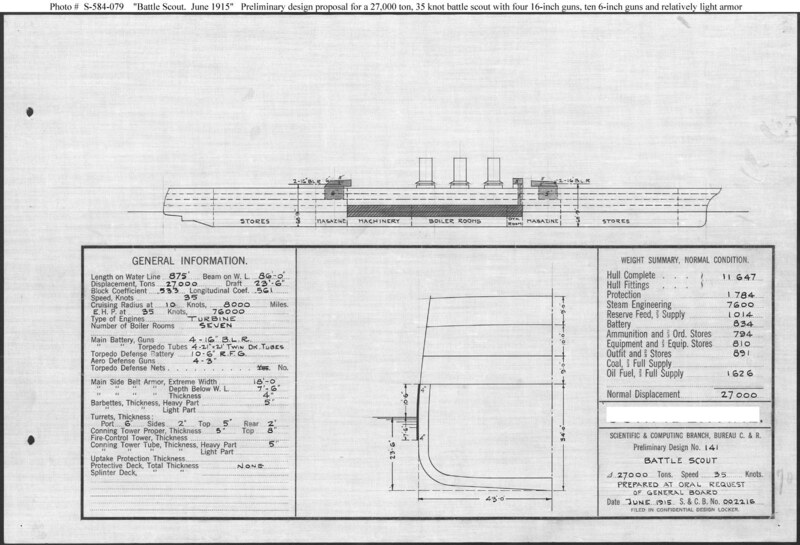 This plan provides four 16-inch and ten 6-inch guns, turbine machinery, and a speed of 35 knots in a ship 875 feet long on the load water line (L.W.L. ), 86 feet.in beam, with a normal displacement of 27,000 tons.